A series of attacks killed more than 115 people throughout Pakistan on Thursday as a wave of violence entered its third week. 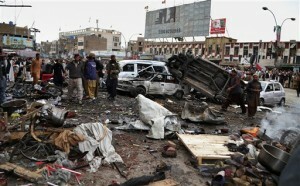 A bomb in a market killed 11 people and wounded dozens in Quetta, the capital of the southwestern province of Baluchistan. Later, dual blasts – set off by a suicide bomber, followed by a car bomb 10 minutes later – killed at least 81 people and injured more than 120 at a snooker hall in the city. Most of the dead included police and emergency crews who rushed to the scene after the first blast. Both attacks targeted areas where the Shia community is the majority. Authorities in Baluchistan declared three days of mourning beginning Friday. The Associated Press reported that Lashkar-e-Jhangvi, a Sunni militant group with ties to the Pakistani Taliban and which has previously attacked Shia targets, claimed responsibility for the snooker hall attack. Meanwhile, in the northwest city of Mingora, 22 people were killed and more than 70 injured when a bomb exploded in a Sunni mosque. Last week, atleast 19 people were killed and 25 injured when a convoy of three buses carrying Shia pilgrims on their way to Iran was attacked by what appeared to be a suicide bomber in Baluchistan’s Mastung district. The attack comes as Pakistan experiences increased attacks by Sunni extremist groups targeting the minority Shia community, who make up 15 per cent of the population of 190 million. In August 2012, 25 Shia pilgrims were forced off a bus and executed near the city of Gilgit in Pakistan’s northern region.